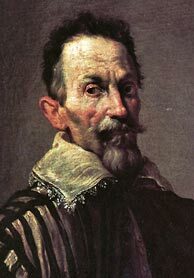 That Claudio Monteverdi was the first great composer of opera was amply demonstrated by his masterful retelling of the story of Orfeo, presented at the Gonzaga court in Mantua in 1607 and, a year later, by another mythical opera, L’Arianna (Ariadne), of which only the famous lament has survived. But he had arrived at Mantua from Cremona in 1592 as an already highly accomplished composer of sacred music, with two published books of sacred songs to his credit, as well as a book of Canzonettas and two books of madrigals; a third book of madrigals appeared soon after his appointment. In any event, by 1610 he was dissatisfied with his situation at Mantua and looking for work elsewhere. The large volume of his church music published in Venice that same year and dedicated to Pope Paul V was assembled from existing as well as new works, and seemed designed to provide a repertory suited, as its title states, “for chapels or the chambers of princes,” while demonstrating the composer’s mastery of various sacred genres. Heading the volume was a six-voice a cappella setting of the Mass ordinary based on an older motet by Nicolas Gombert and employing all the complexities of late Renaissance counterpoint. This was followed by more up-to-date music suitable for a Vespers service on any feast of the Virgin, including Psalm settings for voices and instruments, motets and antiphons for one, two, or three solo voices and continuo, and two Magnificat settings. The 1610 Vespers were performed on Thursday evening at New England Conservatory’s Jordan Hall by the Boston Early Music Festival Vocal and Chamber Ensembles, assisted by the two cornetti and three Baroque trombones of the Dark Horse Consort. Although the Vespers are now often performed (and recorded) with large forces, only ten singers were available at the ducal church of Santa Barbara in Mantua during Monteverdi’s time, precisely the maximum number of parts specified in his Vespers collection. Citing the degree of figural independence and the high level of virtuosity written into the individual parts, both vocal and instrumental, conductor Stephen Stubbs opted for the one-on-a-part solution for Thursday evening’s performance, and the results were spectacular. The singers were sopranos Shannon Mercer (stepping in at the last minute for Amanda Forsythe, who was ill) and Teresa Wakim, mezzo Laura Pudwell, countertenor Reginald Mobley (replacing Nathan Medley), tenors Colin Balzer, Jason McStoots, and Zachary Wilder, baritone John Taylor Ward, and basses Marco Bussi and Christian Immler. Singing at full voice with remarkably coordinated tone color, they were equally effective in full ensemble numbers with instruments and in those accompanied only by the continuo. As pointed out in Massimo Ossi’s article in the program book, the Vespers were probably never intended to be performed as a unified cycle. Nevertheless, the remarkable variety of textures and techniques in the sequence is part of their enduring appeal. The traditional chant formulas or “tones” associated with the various psalms and the Magnificat could be heard sometimes in long-note cantus firmus style, sometimes sporadically within a many-voiced contrapuntal texture, and sometimes as a prominent upper voice. A traditional melody appeared as the top voice in four- and eight-voice verses of the hymn “Ave maris stella” and as a single line in verses for soprano or tenor solo. Perhaps the most striking use of a chant melody occurred in the “Sonata sopra Sancta Maria:” the sopranos intoned the simple litany tune twelve times in various rhythmic guises, while eight instruments, including the magnificent trombones and cornetti, wove a series of animated variations around it. Contrasting with the psalms and the Magnificat for six, seven, eight, or ten voices and instruments were the motets for one, two, and three voices and continuo in a variety of chamber styles. “Nigra sum, sed formosa” (I am black, but comely), a highly expressive song for tenor solo and continuo, reached its impassioned heights at the words “Surge, amica mea” (Arise my love). “Pulchra es, amica mea” (You are beautiful, my love), another text from the Song of Songs, set for two sopranos and continuo, was a love duet in melting parallel thirds—the language of madrigal and opera. Shannon Mercer and Teresa Wakim sang their highly ornamented lines with expressive sensitivity. In “Duo seraphim clamabant” (Two Seraphim were calling), tenors Colin Balzer and Zachary Wilder depicted the angelic guardians with penetrating force and virtuosity. In a madrigalian bit of word painting, they were joined by basso Christian Immler at the words “Tres sunt” (There are three). Colin Balzer was the adroit tenor soloist in “Audi coelum” (Hear, O heaven), a prayer to the Virgin in recitative style with elaborate virtuoso flourishes. Here the seventeenth-century fashion for echo effects showed itself to be alive and well: faintly resounding from offstage were the final syllables of each verse but not the entire word, so that “gaudio” became “audio” and “benedicam” echoed as “dicam,” and so on. Similar offstage echoes were heard from the “Gloria patri” of the Magnificat. Continuo accompaniment varied, from chamber organ (Avi Stein) and viola da gamba (Erin Headley) to the full complement including two chitarroni (Paul O’Dette and Stephen Stubbs), Baroque harp (Maxine Eilander), and double bass (Robert Nairn). It was performed throughout with the greatest sensitivity, enhancing but never obscuring the voices in small-group numbers and providing sturdy support in large-group concerted pieces. Concertmaster Robert Mealy led the strings (Julie Andrijski, violin, Laura Jeppesen,viola, Phoebe Carrai, cello) with verve and clarity. Stephen Stubbs conducted with a sure sense of pacing and continuity. It goes without saying that the sheer magnificence of the psalm settings, with their varied scoring, repeated bass patterns, imitative polyphony and choral declamation, and the seven-voice Magnificat, with its pervasive chant underpinning, alternating solos and ensembles, and instrumental ornamentation, impress us as the work of an immensely gifted and resourceful composer. All in all, one of the best 1610 Vespers performances I have ever heard. This year’s program book, thicker (and heavier!) than ever, is more than generous in its provision of complete texts and translations, including the librettos of the three operas, along with numerous informative articles and useful information on the performers and the exhibition. A book to treasure along with the memory of many fine performances.